Central Indiana Mensa typically has two major events every year: our Regional Gathering in late January and our Outdoor Gathering in mid-May. An outdoor excursion to a group of cabins in the woods. Reasonably described as “camping-lite,” the Outdoor Mensa Gathering (or OMG!) is a trip to the great outdoors of Indiana, with a campfire, hiking, board games, card games, guided discussions, and other activities. 2019 – Howling at the Moon – Join Central Indiana Mensa for a laid-back weekend in the woods. If you’re thinking that you aren’t the “out-doorsy” type, think again! You get food, lodging, scenery, and more for only $65 per person! Saturday only is $45. Kids up to age 6 are $25, and ages 6-12 are $40. There is also a per-car park entry fee. So grab your sleeping bags and towels, and join us at Versailles State Park in the group camp. Saturday, May 18, there will be a full moon. Who knows what can happen??? Register and pay online at: http://cim-og-2019.eventbrite.com. Or download the 2019 OMG! Flyer and mail a completed form and your check to the Registrar. Questions? Please email Gatherings Chair Teresa Gregory. Regional Gathering: WTF – Winter Time Fun! An indoor excursion to the Waterfront hotel on the west side of Indianapolis. Our RG draws people from groups all around the Midwest. With visitors from Chicago, Cincinnati, Kentucky, and Michigan, this event always has a weekend full of events designed to cater to the intelligent crowd. 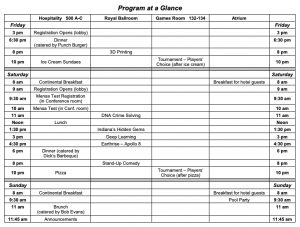 Events from the last few years include how to make and use a ‘bug-out’ bag, comedy shows and improv, chocolate, hard cider, and wine tasting, science lectures, discussions on copyright, and much more. Bring a buddy! Free Mensa test (Saturday morning) for non-members included with a full weekend registration. Please let us know if you have a guest who will be taking the test. Register online at cim-rg-2019.eventbrite.com. Here’s the flyer but it’s too late for snail mail. Registration questions? Please email the Registrar here. Other questions? Please email Gatherings Chair Teresa Gregory. US Mensa’s AG (annual national convention) was held in Indianapolis for the first time from July 4-8, 2018. Our group hosted the event; Teresa Gregory and Jan Pfeil Doyle were co-chairs. Indianapolis native astronaut Dr. David A. Wolf was the speaker at the gala banquet. Over 1700 people attended the event that was held at the JW Marriott in downtown Indianapolis. Click here for information about the 2019 AG.